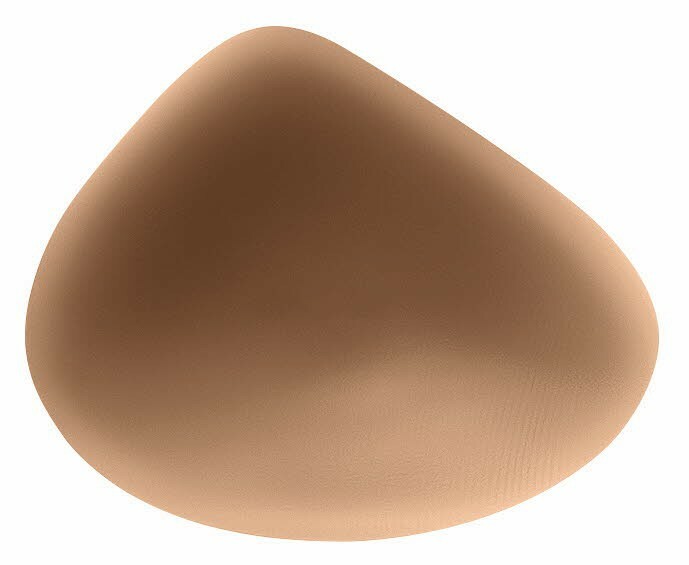 The Essential 3E Light Breast Form, in Tawny color, was created to meet the essential needs of women following breast surgery. It offers a full cup fitting with its world-leading expertise in lightweight silicone. Amoena created a super lightweight silicone that's 30 percent lighter than standard silicone breast forms of the same shape. The Essential 3E Light breast form is a single layer of this lightweight silicone that's soft and flexible to hug the body securely. The form won't irritate sensitive scar tissue. It is comfortable while creating a natural outline to restore a feminine silhouette. The Essential 3E gives the form a natural drape and appearance as well as a natural feeling. An outer InTouch Light Silicone adds a super soft outer layer for a silky feel. The shape is called a universal shape that hugs to the chest. There is a right and left fitting. The form also can be placed in any of the Amoena mastectomy bras which contain bilateral pockets to secure the breast forms such as the Lara Non-Wired Soft Bra .